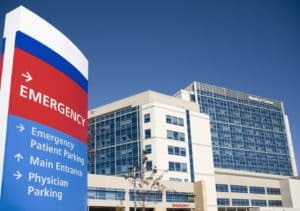 You could be excused for thinking that hospitals are a safe place to visit when you have been injured, have an acute medical condition or just going to see a sick relative. The feeling of protection and security is probably a result of the caring and dedicated staff and large secure looking buildings, but with the advent of the new ice age they are turning into virtual warzones. The illicit drug crystal methamphetamine, commonly known as “Ice’ is becoming an increasing security threat that affects the staff and patrons of hospitals in both the inner city and the rural country hospitals. Data from the Australian Institute of Health and Welfare shows a 175 per cent increase in the number of treatments that were delivered for amphetamine use over five years. Overall the report revealed the number of people seeking treatment for drug alcohol problems is continuing to rise. In 2015-16, 134,000 Australians sought treatment, which is an 11 per cent jump on two years earlier. Additionally, hospitals face many other threats, including drunk patrons. In fact, despite the rise of Ice usage alcohol fueled violence remains one of the significant problem facing hospitals and is made even more challenging because of the additive effect of Ice related admissions drawing on scarce hospital security resources. There is little data on the number of staff and patients at risk or injured because of Ice, however reports are frequently in the media and tragic outcomes are often reported. The staff at hospitals all too often consider assaults and abuse as part of their normal working day and are reluctant to report them. This then translates to limited data on actual security incidents. Despite this head doctors are repeatedly been seen in the media making complaints and asking for respect and for improvements in the safety of their teams. This is especially prevalent amongst emergency department staff who are first point of call and often the first in contact with an out of control addict. Performing security risk assessment in these high-risk environments is paramount to ensuring the safety of staff and patrons. Performing routine security risk assessments and following industry standards and guidelines like AS4485.1 Security in Health Care Facilities in these high-risk areas will help to improve the security posture of the hospital and should form part of a hospitals proactive security function. For further information on how Agilient can help implement and protect your staff from the new emerging threats to your specific environment please do not hesitate to contact us.